For the past several months, drivers whose rushed or sloppy parking impeded the work of New York’s street cleaners met a prompt and sticky fate. Their cars were slapped with neon-yellow shame stickers, almost impossible to remove. According to owners, some cars were left “permanently defaced.” In February, the City Council unanimously passed a resolution banning the stickers, but noted clean-freak Mayor Bloomberg vetoed the measure. 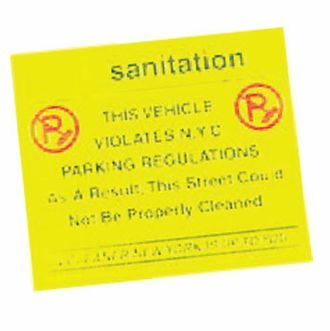 While our own Matthew Shaer proposed the council and the Sanitation Department find a stickiness middle-ground — somewhere in between a Post-it note and super glue — in the end, the politics proved too divisive. Christine C. Quinn, the council speaker, had gotten slapped with a sticker herself, and tried for days to remove it.